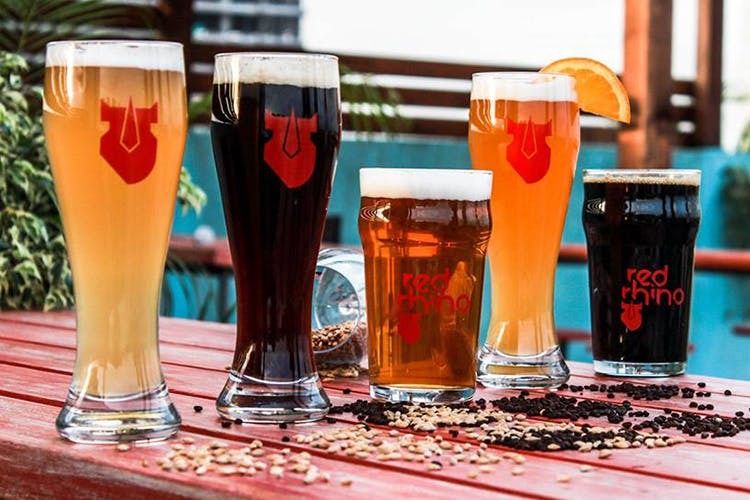 In a galaxy far far away, a microbrewery by the name Red Rhino is serving craft beer from its 5 HL microbrewery system to the residents of this planet called Whitefield. Terrace layouts and industrial-inspired decor seem to be a norm these days, and Red Rhino follows suit. Post office hours or weekend fun, patrons who seek comfort and want to be surrounded by an inviting atmosphere, the place seems perfect. The layout includes the main bar area that’s flanked by a bar on one side and a semi-open kitchen on the other side. Completing the layout are the loft or duplex-style seating layout and a private seating space. For those of you who enjoy the open-air, there’s the al-fresco seating and the terrace bar. The former, just outside the main bar area, gives you the view of the Whitefield skyline with an extended al fresco seating by the massive brewing equipment. The terrace bar is perhaps the best space — an open-air bar where you can sip on a pint, enjoy that cool wind, and chat the night away. Serving four regular brews plus one seasonal brew on tap, the regulars are your Bangalore Daze, an IPA, the Black Pearl, the coffee-laced Stout, the Soul Surfer, a Hefeweizen, and wrapping things up is the GPB, a lager. They also have a changing seasonal brew. Their brewing capacity is 5 HL and it’s touted as one of the biggest in that side of the town. Imported beers, IMFL drinks, and a selection of cocktails complete rest of the menu which is a mix of Asian, North Indian, South Indian, Mediterranean, and Continental fare, with some really good bar nibbles that go well with your drinks. We recommend the dumplings from the Pan-Asian section while the Red Rhino Chilli Chicken is the perfect fiery finger food that adds the kick to your pint. Pizzas are thin crust and 10-12 inches while the burgers are created to unhinge your jaws and served with crispy fries. We didn't try their mains, but the stir-fry bowls and steaks do look perfect for lunch. Or on nights when you're starving. Thursdays through the weekend gets pretty packed and service could take a hit on those days, which would be a bit of a bummer if you've travelled 35 kilometres just to try them out. They have a great spread for their Sunday Brunches, and a range of corporate lunch (and Happy Hours) options worth checking out if you work out of an office that side of town.